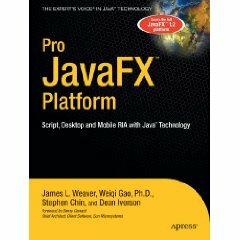 I’ve been working my way through Pro JavaFX, a book by some folks who’ve been working with JavaFX from the very first days and who know what they’re talking about. I haven’t quite made it through to the end, but wanted to post my thoughts and a quick review of the book. Overall this is a really nice book. There is a lot of information here, and a lot of little details and nuances that were news even to me. Perhaps because I know the APIs very well but don’t know the language in as much depth, I particularly like the sections in the book which cover the language itself. There are a lot of interesting things about the javafx language. I usually like to learn a new platform by starting with the language and some very simple examples whereas Pro JavaFX starts you off somewhere near the deep end in Chapter 1. I would personally recommend starting at Chapter 2 and getting your feet wet with some really simple demos (spinning rectangles are a good starting point) before jumping into the large code examples. Chapter 3 was also particularly good at explaining a lot of the basic building blocks that go into JavaFX applications: the Stage, Scene, Animations, and basic Nodes. Between Chapters 2 and 3 you should have plenty of information to get up and running writing your first JavaFX apps. If you’re looking for a handy reference to get started with JavaFX, and for an especially good introduction to the language, I recommend getting a copy of Pro JavaFX.